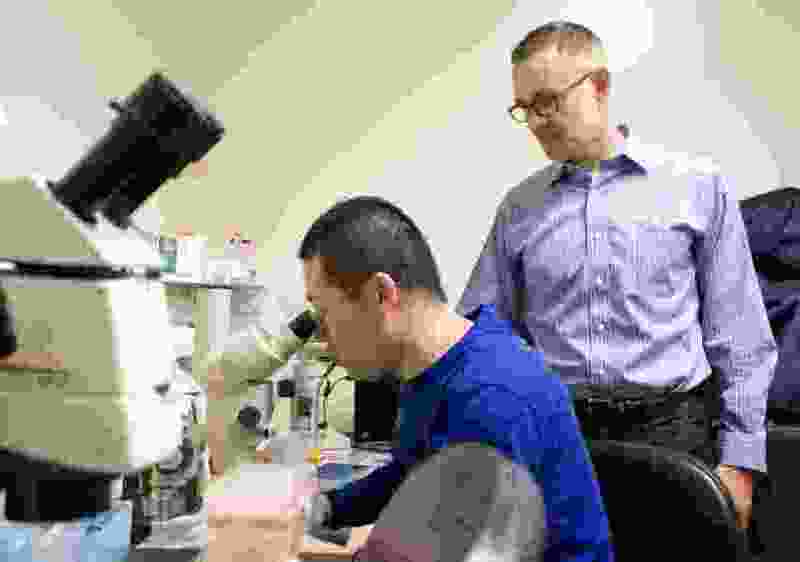 (Geoff Crimmins/The Moscow-Pullman Daily News via AP) In a Thursday, March 15, 2018 photo, professor of molecular biosciences Jon Oatley, right, talks with post-doctoral fellow Deqiang Miao in a laboratory at Washington State University in Pullman, Wash.
Moscow, Idaho • After spending 10 years in Thailand as a child, Jon Oatley, director of the Center for Reproductive Biology at Washington State University, developed a passion for ending food insecurity around the world. Originally from Utah, Oately returned to the states as a teenager, moving to a tiny ranching town in Nevada called Gardnerville. Through friends and other avenues, Oatley said he landed a summer job handling cattle for local ranchers. “That piqued my interest in animals and how to make animals through reproductive processes,” he said. Oatley later turned that passion into a bachelor’s degree in animal science from the University of Nevada, Reno. After hearing about WSU’s graduate program researching reproductive function in cattle, Oatley came to Pullman, earning a doctorate in animal reproduction and later a postdoctoral degree in stem cell biology and genetic engineering — much to his surprise. Oatley said his time in Thailand opened his eyes to the far-reaching effects of hunger and poverty. While much of Oatley’s research is focused on ending hunger in impoverished regions of the world, it has applications even along the Palouse. One method Oatley and his team of researchers use to improve the genetics of food-producing cattle is through gene modification rather than more traditional methods, like selective breeding. This process creates genetically modified organisms, which Oatley said saves researchers much-needed time. The use of GMOs for food production remains a hotly debated topic in America, but Oatley said it’s one subject many consumers simply don’t have enough information on. That’s why Oatley volunteers as a presenter for WSU and Palouse Discovery Science Center’s Science Pub, a series of talks hosted by scientists on an array of topics with the goal of educating the public. The series is hosted monthly at Paradise Creek Brewery in Pullman. Oatley said he hopes public outreach will help give Americans the necessary tools to make decisions for their families based on factual information instead of scare tactics. The lab’s goal is to reduce the number of people who have an empty stomach, Oatley said, and he aims to make that easier for Americans to understand.